Dermaflow technology (DF) has been validated in the measurement of peripheral blood flow in a variety of clinical applications, including peripheral artery disease (PAD). 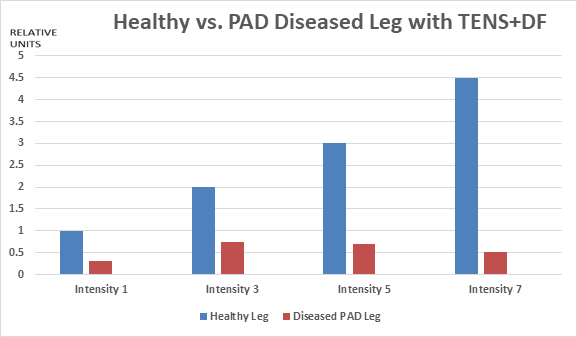 Recent pilot clinical work has confirmed earlier trials in demonstrating the ability of the technology to differentiate between PAD-affected and healthy lower limbs. In this trial, lower limb peripheral blood flow was stimulated using Transcutaneous Electrical Nerve Stimulation (TENS), which is a known effect of this technology. (1) Mobility compromised individuals: research in PAD patients over 65 years of age has shown that lower limb pain in the largest barrier to increasing mobility. The TENS-DF combination will allow simple non-invasive screening of asymptomatic individuals, as is shown in the above chart. There is clear difference between peripheral blood flow in PAD-affected and healthy lower limbs..
(3) Self-monitoring of lower limb peripheral blood flow, for both asymptomatic and PAD affected patients. Use of a TENS-DF can decrease the user probability for development of pre-symptomatic PAD. PAD-diagnosed patients would be able to track the their conditions in their homes towards disease maintenance and improvement.